Robert G. 'Bob' Sagar, 87 of rural Benton (Benton Township), husband of Tonya Boston-Sagar, passed on late Wednesday evening, Jan. 23, at Geisinger Medical Center, Danville. Born on February 4, 1931 in Columbus Ohio, he was the son of Herbert and Agnes (Watkins) Sagar. He and his wife Tonya Boston-Sagar would have celebrated their 33rd wedding anniversary on March 25th. In addition to his mother and father, Bob was preceded in death by his first wife, Tonia (Osinski) Sagar, a sister Ardella (Sagar) Shaub, a brother-in-law Warren Shaub, a brother Jack Sagar and a sister-in-law Connie Sagar. Surviving are his wife Tonya Boston-Sagar, two children, Annette K. Sagar and Robert M. Sagar, two grandchildren: Nahanni Sagar and Elias Sagar, two brothers: Thomas Sagar and William Sagar, a sister-in-law Dorothy Sagar and many nieces and nephews. Bob graduated from Gahanna high school in Ohio. He earned both Bachelors and Masters degrees in wildlife biology at Ohio State University and pursued PhD studies there as well. He moved to Pennsylvania in 1963 to work at Bloomsburg University where he taught biology, ecology, ornithology and many other courses for over 30 years. He retired from the university in 1994 and worked for eight years as a naturalist for PPL Riverlands Environmental Center, taking school and community groups on nature walks and presenting programs and workshops. Bob was passionate about education and spent his life sharing his knowledge with others. He was a director at the Columbia County Conservation District, a member of the nine county Resource Conservation and Development Organization, the Eastern Bird Banding Association and the North Branch Bird Club. He was a lifetime member of the Fishing Creek Watershed Association and started Help Save Our Planet Earth, a student organization dedicated to stewardship of the earth. Community was very important to Bob and he was an active member of the Benton Lions Club, volunteered as an organizer for the Envirothon for high school students across the region and was an advisor in the development of Kocher Park. In 1994 he and his wife Tonya began restoring a fourteen acre wetlands on their farm. This space was a source of education and inspiration for area school children, community members and served as a research area for graduate students. 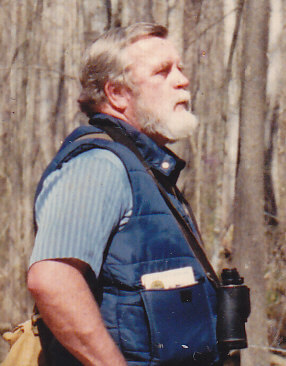 Bob was deeply rooted in the great outdoors and his love of all things in the natural world. The connection and fluidity of humanity and nature, biodiversity and the importance of conservation... his essence and belief.